Hedley Verity, George Geary, Premangshu Chatterjee, Bert Vogler and Albert Moss. I can see you shaking your heads at these names. Other than Verity, who has had a couple of excellent books written about his exploits, the other names are unlikely to ring any bells in the minds of most Roarers. And yet, these fine men, forgotten largely by history as they are, hold the records for the best bowling figures in the history of First Class Cricket. Records which have stood the test of time, so much so that the only performance that is even remotely modern dates back to 1957. It is 1932, World War 2 is still seven years away, and peace reigns in a England whose wounds have barely healed from the loss of a generation of its young men in the great War. Hedley Verity has just made his Test debut at the Oval against New Zealand the previous year, and will go on to earn fame as the man who dismissed Don Bradman more times than any other Test bowler, with his left arm spin. He will also go on to form a close friendship with Douglas Jardine and Harold Larwood, whose example he had followed in making it out of the Coal pits into the bright sunshine of English cricket fields. Verity would play 40 Tests for England in the intervening years, and take 144 wickets at 24.37 with a best performance of 8 for 43. He would finally earn immortality by passing away from his wounds as a prisoner of war in the country of his birth, Italy, in 1943, at the age of 38. But we go back to 1932 when Yorkshire is playing Nottinghamshire at Leeds. Notts scores 234 in their first innings and Yorkshire replies with 163 for 9 before declaring on the third and final morning, in an effort to force a result. Notts takes the score to 44 for no loss, when Verity gets the ball. In a remarkable collapse, Notts goes from 44 for no loss to 67 all out. In his first spell, Verity takes 3 wickets, and then in his second, he takes the other 7 in a jaw dropping 15-ball effort, including a hat-trick. His full figures are 19.4 overs, 16 maidens, 10 runs, 10 wickets. It had rained the previous night, but that doesn’t fully explain his achievement, because right after Notts is dismissed, Yorkshire opening batsmen Percy Holmes and Herbert Suttcliffe have an unbroken 139 run stand and take Yorks to a famous 10-wicket victory. It is only fitting that 85 years later, we are still talking about this performance as being unmatched in its enormity. George Geary was the greatest cricketer Lancashire had produced until the advent of a certain David Gower. But the closest parallel to bowling style that Geary had, was a certain Aussie, who decades later, would become perhaps the greatest Australian fast bowler of all time – Glenn McGrath. Unlike Verity however, Geary was a far more successful First Class bowler than a Test performer, where he took 46 wickets at 29.41. In First Class cricket, he took a staggering 2063 wickets at an unbelievable 20 runs per wicket. To witness his best bowling figures, however, we go back to 1929 when Glamorgan are playing Leicestershire at Pontypridd. Leicester is bowled out for 102 with only three players reaching double figures. Glamorgan, despite a fighting 70 from opener William Bates, can only score 160, with Geary taking 6 for 78 in a long 35-over spell. Leicester does not do much better the second time and is bowled out for 141, leaving Glamorgan an easy 84 runs to win the match. With a day and a half left in the 3-day match, Leicester’s players are already packed, when they come out to bowl. George Geary, however, has other ideas. In a remarkable 16-over opening spell, he scythes through the Glamorgan batting, and takes all 10 wickets for a miserly 18-runs. Leicester wins the game by 16-runs in one of the most stunning turnarounds in First Class cricket. If you haven’t heard of George Geary, it is even less likely that you have come across the name of Premangshu Chatterjee. Chatterjee was a left arm medium pace bowler who played for Bengal in India’s Ranji Trophy in the 1940s and 50s. Despite his lack of genuine pace, he had the uncanny ability to swing the ball on any surface. Chatterjee finished his First Class career having taken 134 wickets at 17.75 apiece. But his crowning glory came in a Ranji Trophy match against Assam played at Jorhat in 1957. With a formidable batting line up led by one of India’s greatest opening batsmen Pankaj Roy, Bengal bat through almost two full days of the four day match to score 505. Premangshu Chatterjee then comes in to bowl his left armed medium pace, and immediately starts swinging the ball prodigiously. In a remarkable 19-over spell, Chatterjee gets the opener Guha Roy caught in the slips with an outswinger he is unable to take the bat away from, and then runs through the rest of the side with in swinging deliveries that are virtually unplayable. The Assam innings folds up for a paltry 54, with Chatterjee taking all ten wickets. Assam follows on and makes 245, but Bengal wins the match by an innings and 206 runs. Premangshu Chatterjee’s 10-20 remains the best bowling figures ever achieved in First Class cricket outside The United Kingdom, and the third best figures of all time. Bert Vogler was a South African leg break bowler who had a mean googly. Much to the dismay of contemporary batsmen, he also combined the speed of Anil Kumble and the flight and turn of Shane Warne in the same delivery. Just to confuse the batsmen further, he was also a good fast medium bowler who often opened the bowling. In the first decade of the 20th century, he was reputed to be the most difficult bowler in the world to bat against and was named Wisden Cricketer of the year in 1908. Vogler played 15 Tests for South Africa, taking 64 wickets at 22.73 apiece. His First Class figures were even more impressive with 393 wickets bought at just over 18 runs each. He was also an accomplished middle order batsman in both formats of the game. Bert (or Ernie) Vogler, will however remain immortal for a Currie Cup match that was played in December 1906 between Eastern Provinces and Griqualand at Johannesburg. Eastern Provinces scores a massive 403 with Bert Vogler contributing 79. Vogler opens the bowling with his fast medium, picks up two wickets and soon switches to leg breaks and takes four more. He ends up with figures of 6-12 and Griqualand is all out for 51. Griqualand follows on and this time, Vogler changes his tactics. He opens the bowling, and in tactics that would be used by the likes of MS Dhoni a hundred years later, he starts with his leg breaks. The effect is simply devastating. Vogler runs through the Griqualand batting on his own this time. When the opposition is dismissed for a second time that day at the identical score of 51, Bert Vogler’s figures read 12-2-26-10. A hundred years later, this remains the best bowling figures ever achieved in the game in the Southern Hemisphere. Cricket was a bowler’s game in the nineteenth century. 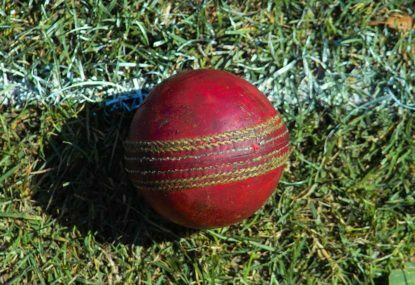 A law change in 1884 outlawed any covering of the pitch once play was under way, which meant conditions could change drastically during a match, usually in the bowler’s favour. A wet pitch that was drying out would produce uneven bounce and still have enough moisture for the ball to move off the seam. Born in the English town of Coalville, Leicestershire, in 1863, Albert Moss was the second of six children to Edward and Ann Moss. He immigrated to New Zealand in 1889, a decision that would transform the record books. It is December 1889 at Christchurch, and Canterbury are playing Wellington. Albert Moss has just come up the ranks thanks to his club performances and is making his debut for Canterbury in a First Class match. Canterbury scores 138 on a difficult pitch and rain ends the day early. The next morning Wellington comes in to face Moss on a wicket that is tailor made for his style of fast bowling which depended on movement off the pitch. Moss is in his elements and in a performance never before or after seen in New Zealand, he runs through the entire Wellington line up taking 10 wickets for 28 runs in his 19.3 overs. Wellington is dismissed for 71. Moss then takes 3 wickets in the second innings and Canterbury wins the match by 33 runs. Despite the talent, Moss was to go on to play only 4 First Class matches in total. He was tried and convicted for trying to murder his new wife with an axe, but on grounds of insanity, jailed for five years then deported to Rio de Janeiro. There he was to recover his mental strength, join the Army and have a successful career. He was also to marry his childhood English sweetheart and wife for a second time when Mary moved to Rio after she learnt he had recovered. But Albert Moss was never to play cricket again.